UPDATE: A second man who was subject to a large-scale cross-border police manhunt has been arrested. NSW police confirmed the 27-year-old was taken into custody about 9am today after a two-day search for his whereabouts. Officers from the New England Police District, with help from the dog unit, arrested the man following a police operation at a property in Bucknell St in Mungindi. "He was taken to Mungindi Police Station where he is expected to be charged," police said. It follows the arrest of a man, 29, near Dirranbandi about noon Wednesday. That man has been charged with a string of offences relating to the manhunt as well as a series of alleged property crimes. EARLIER: Police have charged a 29-year-old St George man with 22 offences after a series of incidents which originated in New South Wales and continued in the Dirranbandi area over a two-day period. 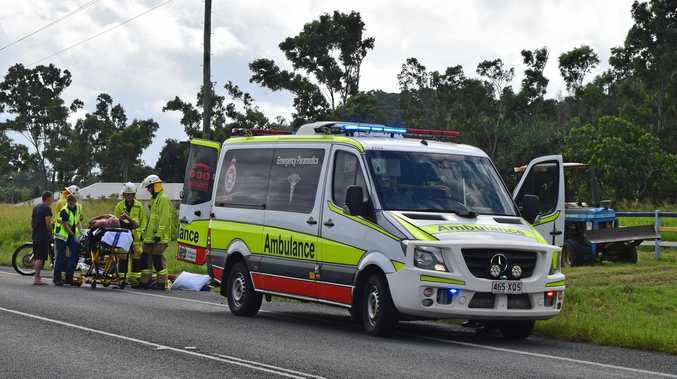 Police will allege around 2pm on May 22 they attempted to intercept a man as he travelled across the New South Wales - Queensland border in a stolen 4WD utility. It will be further alleged that the man collided with a police vehicle causing minor damage during the attempt to intercept his vehicle. About 5.50pm that day the man drove into dense scrub land while attempting to evade police, with his vehicle sustaining damage and becoming unable to be driven. A 42-year-old local man, who was in the vicinity, allegedly had a firearm pointed towards him by the offender, before the offender fled on foot. The male victim was not physically injured. Around midday on May 23, with the assistance of New South Wales police, the man was apprehended hiding in bush land on a property outside Dirranbandi. Subsequent searches of areas where the offender had sought refuge overnight resulted in the locating of a number of alleged stolen weapons. Police would like to thank the New South Wales Police Force (New England LAC) and members of the public, particularly in the Dirranbandi area for assisting police in the search and apprehension of the offender. A 29-year-old St George man has been charged with weapon, property and serious traffic offences, some of which include- dangerous driving, dangerous conduct with a weapon, discharging a weapon, unlawful possession of a weapon, unlawful use of a motor vehicle, fail to stop a motor vehicle, common assault and obstruct police. Investigations are continuing and it is envisaged further charges may be laid in the future.